Today I'm featuring the opening from a book I borrowed from the library . . . 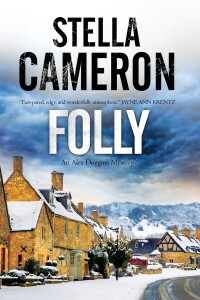 Note: FOLLY was originally published August 13, 2013 as COLD in eBook format. How long had it taken to change a life forever? A minute, ninety seconds - while he listened, barely understanding, as two men destroyed his own young innocence, and allowed another child to die? Early the previous year, Alex Bailey-Jones had come home from London to the Cotswold Hills, to Folly-on-Weir, to bury herself in familiar surrounding and to become too busy to live in the past. I'm excited to start reading this book because the Cotswolds village setting appeals to me, and I'm always eager to begin a new mystery series. First Chapter ~ First Paragraph #109 was originally published by Catherine for bookclublibrarian.com. This post cannot be republished without attribution. Retweeting and sharing on Google+ encouraged.